Muscle tissue varies with function and location in the body. 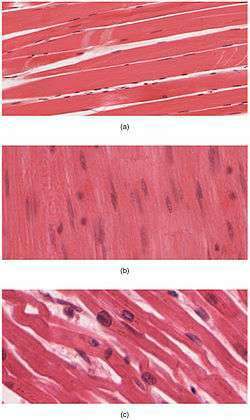 In mammals the three types are: skeletal or striated muscle; smooth or non-striated muscle; and cardiac muscle, which is sometimes known as semi-striated. Smooth and cardiac muscle contracts involuntarily, without conscious intervention. These muscle types may be activated both through interaction of the central nervous system as well as by receiving innervation from peripheral plexus or endocrine (hormonal) activation. Striated or skeletal muscle only contracts voluntarily, upon influence of the central nervous system. Reflexes are a form of non-conscious activation of skeletal muscles, but nonetheless arise through activation of the central nervous system, albeit not engaging cortical structures until after the contraction has occurred. 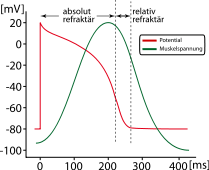 The different muscle types vary in their response to neurotransmitters and endocrine substances such as acetyl-choline, noradrenalin, adrenalin, nitric oxide and among others depending on muscle type and the exact location of the muscle. Cardiac muscle is involuntary, striated muscle that is found in the walls and histological foundation of the heart, specifically the myocardium. Cardiac muscle is one of three major types of muscle, the others being skeletal and smooth muscle. These three types of muscle all form in the process of myogenesis. The cells that constitute cardiac muscle, called cardiomyocytes or myocardiocytes, predominantly contain only one nucleus, although populations with two to four nuclei do exist. The myocardium is the muscle tissue of the heart, and forms a thick middle layer between the outer epicardium layer and the inner endocardium layer. 1.They carry out movements of the body. 3.They maintain the posture of the body. It is responsible for the contractility of hollow organs, such as blood vessels, the gastrointestinal tract, the bladder. 1 2 3 "Muscle Tissue TheVisualMD.com". www.thevisualmd.com. Retrieved 2015-12-30. ↑ Pratt, Rebecca. "Muscle Tissue". AnatomyOne. Amirsys, Inc. Retrieved 26 October 2012. ↑ Marieb, Elaine; Hoehn, Katja (2007). Human Anatomy & Physiology (7th ed.). Pearson Benjamin Cummings. p. 317. ISBN 0-8053-5387-9. ↑ McCloud, Aaron (30 November 2011). "Build Fast Twitch Muscle Fibers". Complete Strength Training. Retrieved 30 November 2011. ↑ Larsson, L; Edström, L; Lindegren, B; Gorza, L; Schiaffino, S (July 1991). "MHC composition and enzyme-histochemical and physiological properties of a novel fast-twitch motor unit type". The American Journal of Physiology. 261 (1 pt 1): C93–101. PMID 1858863. Retrieved 2006-06-11. ↑ Olivetti G, Cigola E, Maestri R, et al. (July 1996). "Aging, cardiac hypertrophy and ischemic cardiomyopathy do not affect the proportion of mononucleated and multinucleated myocytes in the human heart". Journal of Molecular and Cellular Cardiology. 28 (7): 1463–77. doi:10.1006/jmcc.1996.0137. PMID 8841934.